On the latest episode of the iDisciple Podcast, iDisciple CEO David Henriksen is joined by renowned author and public speaker, Dr. Emerson Eggerichs. Dr. Eggerichs has spent several decades writing books and speaking around the world on the topics of marriage, parenting, and communication. Dr. Eggerichs has authored several books about those topics, including the New York Times bestselling marriage book Love and Respect. Eventually, this book lead to the Love and Respect Marriage Conference, a dynamic and marriage-changing conference for couples that has resulted in countless relationships being restored. More recently, Dr. Eggerichs has completed and released a new book about the pratfalls of miscommunicating, Before You Hit Send: Preventing Headache and Heartache. 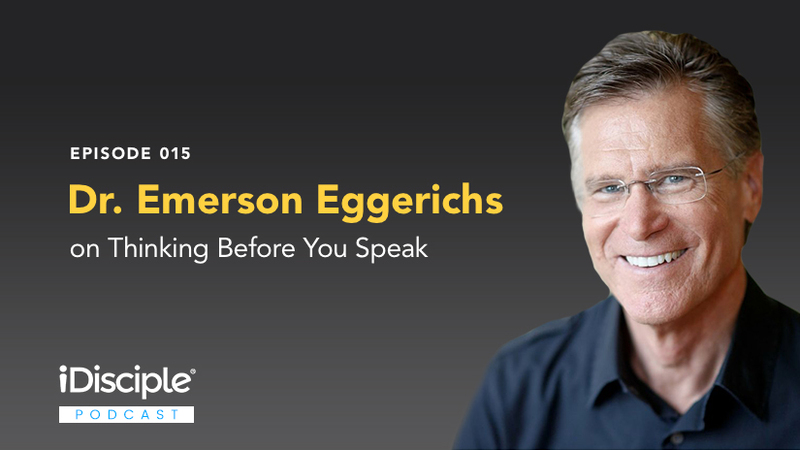 Dr. Eggerichs latest book is based on years of research, anecdotes, and biblical study, and is a humbling glance into the mistakes we make when we communicate with the people around us. We pray that Dr. Eggerichs’ knowledge and discernment about marriage and communication will open your eyes to new ways you can live your life more like Jesus! What motivated him to write Love and Respect, specifically why he believed it was important to write a marriage book for both men and women. Dr. Eggerichs shares some examples and stories from the Love and Respect Conferences of people whose marriages were radically changed and healed when they came together with their spouse to fix their problems. The origin of Dr. Eggerichs’ 4 Questions to ask before you speak: Is it kind? Is it truthful? Is it necessary? Is it clear? How new technology is both helpful with the speed we are able to communicate and hurtful with our tendency to say things we wouldn’t say face-to-face. The reason why someone taking offense to our words is not necessarily a bad thing, as long as what we say fits under the umbrella of the Four Questions. Why financial stress in marriage can’t be fixed by more money or less money because the real problem is in your heart. And many more great biblical takeaways! Thank you so much for joining us! We hope and pray that this episode of the iDisciple podcast was enlightening and relevant to you. If you enjoyed this episode, head over to iTunes, Google Play, or Stitcher Radio and subscribe to the iDisciple Podcast. While you’re there, please leave us a rating and a review. We love to hear feedback from all of our subscribers! If you would like even more life-changing content authors like Dr. Emerson Eggerichs, download the iDisciple app! Since 2013, iDisciple has been leading people into a closer relationship with God through music, sermons, and devotionals, all in the palm of your hand! Check out iDisciple to learn more, and sign-up for iDisciple today.